Look professional with clean and pressed clothing and arrive a few minutes early to start your shift on time. Be courteous to coworkers and understand what is expected of you to perform your job with a positive attitude. Having a routine and being organized increases productivity. 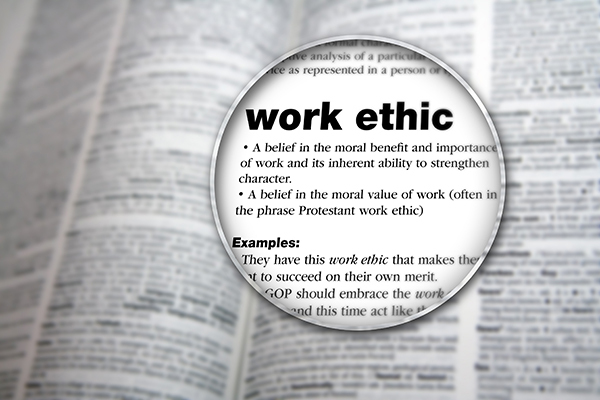 Those with strong work ethics tend to be more productive and efficient with their time, which frees up opportunities to help others get more done. Be cooperative and a team player. You realize that you’re a part of a team and that everyone on that team plays an essential role. Realize that if the company as a whole is successful, you will also be recognized as part of the team. An employee with a strong work ethic doesn’t wait for someone else to deal with the problem. Figure out a solution and work at it until the problem is fixed. The work produced by an employee with a strong work ethic is not only good quality, but it often goes above and beyond what is required without having to be asked. Make sure your workspace is clean and organized neatly for customers.